A long time ago, First Man and First Woman lived among the clouds. One day they got into a dispute and First Man angrily pushed over a big tree. It ripped open a hole in the clouds and First Woman fell through the hole. As she was falling towards the water below, the Wingeds (the birds and insects) did their best to keep her up in the air so that she would not drown in the water below. Meanwhile, the other animals talked with each other to make someplace for her to land. Beaver brought up a bunch of sticks, but unfortunately the sticks broke up and floated away. Finally, after many other attempts, the other animals asked Terrapin if he could help. He agreed and so they started to pile soil on his back. As he came to the surface he became bigger and bigger, and became Terrapin Island, what we now call North America. First Woman lands safely on the Terrapin’s back and makes it her home. 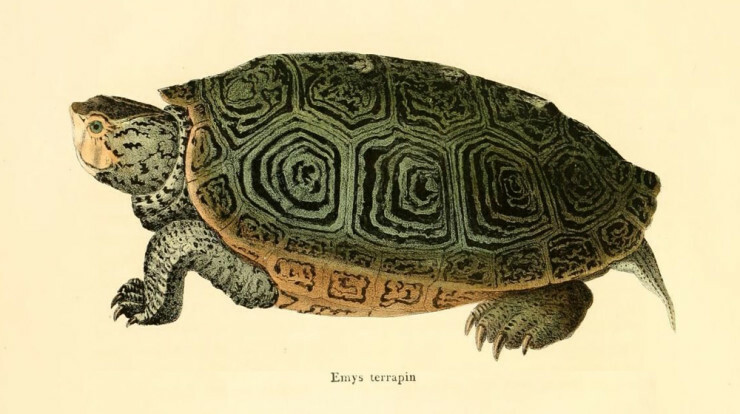 Okay so I cheated a bit, Terrapin is actually the Algonquin name for turtles, the Mohawk name is a’no:wara, which is a bit difficult for most folks to pronounce. Terrapin is also the name for a species of turtle that can live in both fresh and saltwater. With our firm’s dedication to reconnecting people to Earth’s natural environments, we felt the Terrapin story is particularly appropriate to reflecting this mission. We see our role as the Terrapin, supporting the natural environment to create a better home for humanity.